Update: Disqus has announced the details of the updates in a post on their blog. New, enhanced API for things like mobile apps. While we’ll have to wait a few more hours until all the new features are live, but I think the bigger picture here is that more sites that are providing us with valuable add-ons to our social media life are moving to a freemium model. 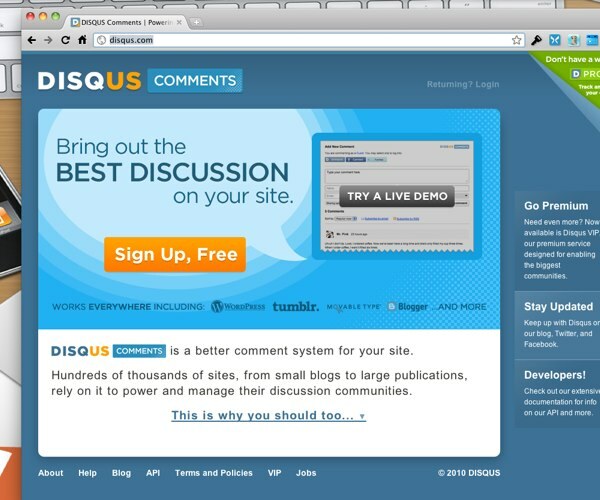 HootSuite is offering Basic and Pro, now Disqus, Bit.ly is on that track as wel as is Instapaper, Simplenote, and Xmarks. Personally, I think it’s about time. We’ve gotten a lot of value from these apps over the past years. Running, developing, supporting, and improving these apps require resources—resources that cost real money. Am I going to pay for Pro features in all the services I use? Nope, I don’t need the Pro services for all things I use. But Instapaper? Simplenote? Xmarks? Oh yeah. Those are on my list of apps to support. What freemium apps are on your: “I want to pay for to get more” list?